Though her work is not widely read today, Bryher was the author of many well-respected historical novels; her books explore a variety of periods in human history, from the last days of the Roman Empire to the Norman Conquest. Today Bryher is, perhaps, better known as a central figure in an international community of modernist writers and intellectuals that included James Joyce, Marianne Moore, Gertrude Stein, Sylvia Beach, and Ernest Hemingway, among others. Another member of this group, Hilda Doolittle, the celebrated imagist poet known as H.D., was Bryher’s lifelong partner. The daughter of Sir John Ellerman, a wealthy and powerful British shipping magnate, Bryher was born Annie Winifred Ellerman and throughout her life she was known to her family as Winifred. Her resistance to traditional female roles complicated her early relationship with her family; as one scholar has noted, “Bryher grew up intelligent, rebellious, and furious she was not a boy.”3 Bryher renamed herself after one of the Scilly Isles off the coast of England where her family spent summers when she was a child. The Ellermans traveled extensively when Bryher was growing up; early visits to Egypt, the Middle East, the Mediterranean, and elsewhere led to her interest in archeology and history and were influential in shaping her writing. As a young woman, Bryher traveled to the United States with H.D. While visiting New York City, she met Robert McAlmon, a writer. Soon after they met, Bryher and McAlmon were married. Marriage freed Bryher from her family’s control, allowing her to live as she pleased without her parents’ interference. Together the couple founded Contact Editions, which published avant-garde literature. Bryher and McAlmon were quite different—she preferred to stay at home and meet quietly with friends while he liked to go out to cafés and bars with other writers and intellectuals. He was popular with Paris’s bohemian artists in no small part because of his openhandedness at these gatherings. “The drinks were always on him,” Sylvia Beach wrote of McAlmon, “and alas! often in him.”4 Bryher’s marriage to McAlmon lasted fewer than ten years. Bryher was a generous and courageous woman who aided many in the arts in a variety of ways. Her commitment to artists is evident in her founding of the Bryher Foundation, an organization that made monetary grants to writers and artists. 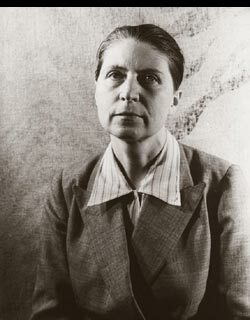 More significantly, however, Bryher used her wealth and influence to rescue innocent people, including many writers and intellectuals, from the Nazis during World War II. She was very private about her efforts to assist her friends in their flight from Nazi-occupied areas and so she is not commonly recognized for this remarkable effort.